Eagle owls are an uncommon species in Britain and those living here today are widely considered to be the descendents of birds that either escaped from captivity or were deliberately released from private collections during the 19th century. Certainly, there are very few references to these birds in British folklore, which some take as evidence of their absence. 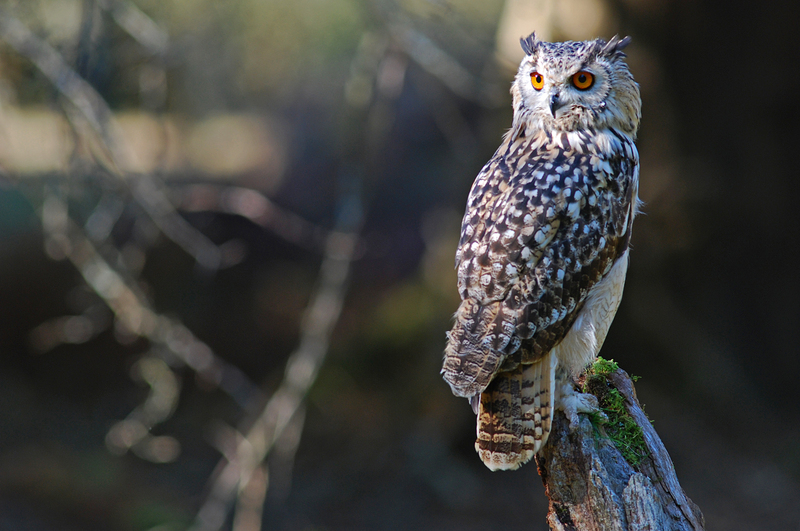 Nonetheless, the World Owl Trust consider some populations in northern England are naturally occurring, having migrated from continental Europe. There are no official estimates for the number of Eagle owls in Britain, although some authorities have suggested as many as 40. That which follows is a summary of Eagle owl natural history. The detailed article for this species is in preparation. Multiple subspecies proposed, some have been regarded as distinct species; 13 subspecies recognised, with Bubo bubo bubo from the UK. Size: Large owl standing 58-71cm (23-28in) tall, with a tail 23-30cm (12in) and wing length of 41-52cm (16-20in). Weigh 1.5-2.8kg (3.3-6 lbs) and 2.3-4.2kg (up to 9 lbs) for males and females, respectively. Colour/Appearance: Large heavy owl with prominent ear tufts (feathers), bright orange eyes set in grey facial disk. Primarily a ‘rusty’ brown colour with black markings, including irregular spotting and black streaks on breast. Darker back, paler underside. Distribution: Widespread throughout northern, southern and western Europe but has limited and patchy distribution in Britain; populations here may be immigrants or escapees from captivity. Many single or unconfirmed reports of owls from England, including on the Peak District moors in Derbyshire. Reports of birds living wild in Scotland (Galloway, Invernesshire, and Sutherland) and parts of England (e.g. Bolton in Greater Manchester, North Yorkshire moors, Bowland in Lancashire, and Northumberland). Longevity: Can exceed 60 yrs old in captivity, but oldest wild (ringed) bird died at 19 yrs old. Sexing: Visually identical, but females heavier than males and calls sexually indicative. Activity: Occasionally hunt during the daytime when feeding chicks but otherwise active primarily between dawn and dusk. Territory/Habitat: Territorial by nature, but not strictly (territories may overlap). Roost by day in trees or rock crevices. Range size linked to prey availability and averages around 14,000 ha (140 sq-km / half a sq-mile) in moorland habitat. Diet: Small and medium-sized mammals such as rabbits, hares and hedgehogs; reputedly attack foxes and small deer. May take gamebirds including pheasants and, during 2010, Bowland Fells bird filmed raiding Hen harrier nest and attacking the female. Known to feed on buzzards, barn owls and herons in Europe. Fears raised that owls could take dogs and cats, but no evidence for this in Britain. Rabbits account for 90%+ of prey where supply is good. Reproduction: Nest in sheltered areas along rock faces/walls; in Europe successfully nest in quarries (apparently undisturbed by blasting) and known to excavate disused ant-hills. Female lays up to 4 eggs at 3 day intervals during late-winter. Female incubates eggs for about 34 days (fed by male) and hatching remarkably synchronised given period between eggs being laid; chicks brooded for about 2 weeks and chicks start feeding themselves at about 3 weeks old. Chicks can make short flights at around 7 weeks old and are cared for by parents until about 6 months old. Behaviour and Sociality: Often pair for life and male and female may roost together during the day. Deep resonating ‘buoh’ call of male and higher-pitched ‘huhooh’ song of female often heard as duet. Threats: Human persecution has led to local extinctions across much of its European range, where it is now considered endangered. Persecution seems the greatest threat to the bird in Britain (several established pairs were deliberately killed), but too early to be sure.